Are you running short of fuel at unknown place, while traveling form A to B? Wanted to track Near By Gas Station when there is no one to ask? Well, Google cares about your problem and so, they rolled out Android and iOS Google Map app update to locate Near By Gas Station along with other nearby search point of interest location. The only requirement to search for Gas Station is to have Google Map app in your device and a internet connection or if you have an offline area saved, then their is no need to have an internet connection too. Just grab your mobile open up Google Map and type “Gas Station” in the search box provided, which results out the near by Gas Station to you on the Map with red indicators as seen below. You can also increase the search area by providing the city name followed by ‘gas station’ keyword for example ‘San Francisco gas stations’. 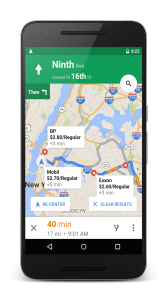 Not only this, but Google Map would also try to help you in providing current rate of Different Gas Station in real time, which will definitely helps you to save some bucks comparing prices and lets you decide where you should fill your vehicle tank. 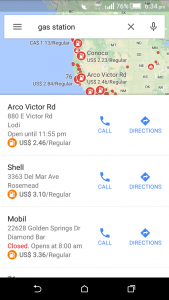 If you are in navigating mode, then the user can tap on a search icon, then select the gas stations from the drop down menu list which also includes coffee shops, restaurants and grocery stores as indicated by official blog for Google Maps. This feature will really helps in real time while on a trip, in finding Gas stations when you notice your vehicle gas tank indicating nearing empty. What you think about this Google Map Features? Are you travelling regularly and finding the way to find near by Gas Stations? Is this feature helpful for you? Do share your valuable thoughts by commenting below in the space provided. 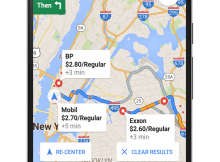 Do you know where Google gets its data on gas prices from?